love this. :) i love the speckles of red throughout the outfit. awesome scarf! what a perfecto combination of textures and colors! He's wearing the cutest pants! I think that I will have to copy this look. Interesting combo. Looks like he snagged a couple of cool chairs at the market. I love the pants….not sure about the total ensemble though. It's all good till I get to the ill-fitting, odd pants. Excellent glove choice, man! what a stylish way to conceal a neck brace! I love the texture of his jacket and the layering of colors throughout. This is delightful! Love his trousers. Are you serious? this is really bad! Gli accostamenti studiati alla perfezione…un mix molto gradevole! I LOVE THE ENTIRE LOOK, EXCEPT THE SHOES; ALL THE REST LOOKS VERY LANVIN..
oh my god! love the pants! Fantastic! Hurray for great flea markets. Have yet to visit one in Japan. that tie makes the checked scarf and shirt a brilliant combination! Awesome, specially the red tie, it just catches you eyes for sure! !… really cool! this seems to be a combination of 2 outfits: a blue/gray/red and a green/beige one. nice clothes, but together? good combination of colour and texture, but an awful fit. I really dig the aesthetic appeal of the layers and the bursting red. Really DOPE!!! The shrunken jacket, the head-supporting scarf, the constant repetition of red, the trousers which, due to the red flecks reminds me of go-to-hell trousers, it's all a little comical isn't it. 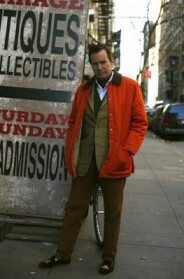 That said, he's a stylish clown, and another example of the variety of colourful people in NYC. I'm not sure I like it, but that is interesting! and lovely! fantastic pants … but you are in the Pitti Immagine Uomo? He looks so cool! Love his pants! Did he spray paint the pants? Interesting. Thank you for such beauty! whoa interesting pants. Where did he find those? Sartorialist you should visit Japan…wonderful styles there ! I'm pretty sure someone could wear ANYTHING bizarre and ppl would find it "amazing." I guess that's what I love about NYC though. Still….some things CAN look off. I think the guy is probably fun and eclectic, but not sure I love this combo. Not sure what I LOVE more: the pants or his chair find. Excellent on both. Is he on his way in to the flea market, to deposit his outfit? Or on his way out, having assembled this hotchpotch? It's a real pity that nothing fits; the style indiosyncrasies would be great if things hung better. Love the jacket. Nice style. The outfit under the jacket looks great but the jacket doesn't look good over all those layers and the shoes are just nasty. A good coat and a great pair of brown boots and all could be redeemed. All the pops of red in the sign and bag and his outfit look almost art directed. Shoes make an individual, this photo proves that too! What a weird but funny outfit, I love it! Well done! My boyfriend has a similar french hat, a U-NI-TY, which is cool for a woman too. I wear it with a wee dress and high heels! Love the way the "pea" colored gloves awaken the hypnotic repetition in the jackets pattern! If he lost that hat and got some real shoes he might not actually look homeless. wow, i love his pants! Love the Look. The Sign behind him is perfectly placed too! This gent is the "before" or "don't" picture. The shirt, sweater and tie are OK, but the jacket is almost Chaplin-tight. Even worse is that he looks like he stole the pants from Ringling Brothers. My god this pant is amazing ! What are these red spots ? haha, i love the pants! His jacket and the scarf. If you look really quickly, you could see a resemblance of a woman. It´s genial! I like his use of the short scarf and the subtle touches of red and green throughout his outfit. He's so funny luv it!!! It looks really cold there. trying to put one over on us?? wow, tjis trousers are so unusually. What are that red marks? I riotous combo of colors and textures. I could not pull this off but he does. This has put a smile on my face. Valentine Man!!! I would never ever in a million years have thought of putting this outfit together – but it works! What has happened to this blog? There is barely one post a day, if that. Genial Mr.Schuman! this man is just WONDERFULL! I love the pants :) !!! I love how the color red is very minimal on the whole outfit yet it makes the ensemble stand out. Notice the red signs on the yellow poster in the background and the red on the plastic bags on the chair next to him. Amazing photography. Good job!!!!! This guy is just too cool for really playing around with all the stuff he's got in his closet. New York certainly has a different flavor than Florence or Milan, doesn't it? Thumbs up to the shirt and tie buried underneath everything else. A very ecclectic combo. Too much going on for me, looks like street person chic to me. Love the stylish scamp flavor of his look. Reminds me of something Charlie Chaplin would wear. Love the red flecks on this pants, the scarf, and his green gloves. Veyr eye-catching without being over the top. Affected. Do like the GTH pants though. Look like the O'Connell, Lucas, Chelf variety. Is the red pattern on the pants love-hearts? And the detail on the glove…is there something written or is it just embroidery..??? I want to go to any flea market where I can look at people dressed like him, most of them out here in northern ca. are filled with people that look like they rolled out of bed and went to the flea market with one exception, you must go to Alameda Antique market, 1st Sunday every month, among the sad dressers you will find some very cool people. The pants remind of the critter khakis that J Crew used to sell – the ones with the little whales or whatnot embroidered all over. AWESOME!! Love the flashes of red, and the pants themselves……..! You are back with a vengeance mr. scott! Aah, I just can't agree with those trousers! But by the looks of things, I don't think he is too worried what other people think of him! Cool look, but i don't know about the black shoe, tan wingtips & would been OVER!!!!!!! Look at him! I love him! PERFECT combination of colors! That could be Junya Watanabe fall winter 2012! I adore such colorful people of NY. I guess its all about NYC because here in Boston I'm not sure this outfit would elicit so many "amazings", "art", "cools" as it did here. I guess i'm not as creative as you all are but this looks ill matched, ill fitted and just silly to me. I do however like his chairs. I love his trousers!!! The outfit is very nice, crazy and so so wonderfoul! so cool! I love his pants! I agree with the person that asked if he was leaving this outfit at the flea market! Lose the pants, shoes, and get a jacket that fits and you could have something to work with. Although, I do love the attempt, attitude, and the colors! If the chairs were replaced with a shoping cart and a half empty wine bottle the look would be complete. I am excited and happy When my brother is a respected Have met with your snap him this the right times. Are those simply triangles? Red squares on his pants? This is a great look…. Let me put it this way: Interesting. I love this! Love the suit, love the sports jacket and scarf! I just love the whole thrown together look of it. It ends up looking really cool! Are those Napoleonic bees on his trousers? I don't think so, but I love the idea of "critter pants" (as Jorge from W Palm Beach calls them) in winter ..
That button has about had it. Love when people, specially men's, mix patherns, dare to mix patherns. After growp up thinkning that this was wrong, now I'm a fan of mix without shame. It works, it totally works. All the colors fit with each others. And maybe he didn't realize it. Eclecticsm at it's satorial best! Each one of your pictures capture more than just the outfit. I can only imagine this guys personality! Great pants. I love the print. hey! check out my new blog. its a fashion/ homedecor/ beauty/ more blog. If you like it, i would be overjoyed if you could somehow promote it on your site! i love the hint of red. clever and deliberate. Eye-catching but not a big fan of the outfit as a whole. Cute pants! And the splashes of red throughout are inspired. Makes a change from just one red item like shoes, or a bag! A perfect way to inject some colour into a winter outfit! gosh, i want to escape to new york sometimes! this is terrific! your blog is such an offering. thank you for the adventure in 2009, adn look forward to more in 2010. i voted for you for best fashion blog in the 2010 bloggies!! P.s: Are you coming to Florence this week? HIS PANTS IS JUST INCREDIBLE ! IT'S A REAL PLEASURE FOR ME TO SEE THAT SOME PEOPLE ( LIKE ME ) REALLY DARE WEAR WHAT THEY WANT ! YOU'RE DOING A GREAT JOB MISTER SARTORIALIST !! THANK YOU FOR ALL THESE ISPIRING PHOTOS ! love the textures and colours, accessories are great and well thought. inspiring! have to try something similar. I love when some one does not take fashion so seriously!!!!! Let the guy be himself and celebrate that!!! the scarf, the pants: what a perfect match! crazy man! nice to see a different type of trouser on a man! Do you have a fantastic blog, with nice photos and smart posts. I loved, loved to have seen you in Rio / Brasil. I love the use of red with the complementing colour of olive in the gloves. I'm a blogger to! I'm only eleven so please forgive me if my comment is as polished as the others……anyway I have recently started a blog called velobelle.wordpress.com and I'm so excited! I have seen alot of your blog and I LOVE it! thank you for reading this! The detail on his pants remind me of Miu Miu s/s 2010. Haha! Looks like he knows what he's doing…the green gloves really stand out to me and contrast with the red in his outfit quite nicely. Great blog, I will keep reading! The trousers are real eyecatchers. And with the blazer & scarf it looks too fab! My dear Dad had pants like those, in green corduroy for winter. Definitely a man unafraid of making sartorial statements. I know how cold it's been in NYC this January and just wonder why this fellow isn't wearing a proper overcoat? Go buy one at the flea market! The nicely-textured jacket would be OK if proportioned to fit better over the cardigan the man is wearing underneath it. However, I still think that the pants are more Ringling Brothers than Brooks Brothers. I love this site and the blog, just don't care too much for this out fit. Looks like homeless person chic, I think there is too much going on. While some of the pieces work well by themselves, I believe this is too much for me. Keep up the good work, I visit just about every day. I think those are the most awesome pants I've ever seen, charming! SO COOL. one of your best pictures! i love the red specks in his clothes with the red arrows behind him. very pleasing composition too. i thought the background looked familiar.. this place is the Garage btwn 6th & 7th? they always have interesting things there. the only way i recognize it is by those plastic curtains. You are a great blogger. I like your work. Truly you are a genius. Keep up the good work Man!! love the pic…not so much his combo though. judging by the responses above i'm not a part of the majority here =P but I do prefer less texture. I love this look!!! really nice! ahhh, the garage. The outfit is OK but no doubt you'd find way more amazing stuff inside. This is just perfect.The street is always the best spot to site fashion. I recognize the blazer! It is Tahari from the 1980's or possibly even 5 years earlier. I had a hard time giving mine up and seeing it here isn't helping! the two arrows behind him work well with the whole pictorial composition…love the outfit. What a perfect combination of patterns and textures. Looks effortless but I'm sure he thought about every little piece of his ensemble.